Rising 714 feet, the Republic Plaza is not just the tallest building in Denver, but also the tallest in the entire Rocky Mountains region. 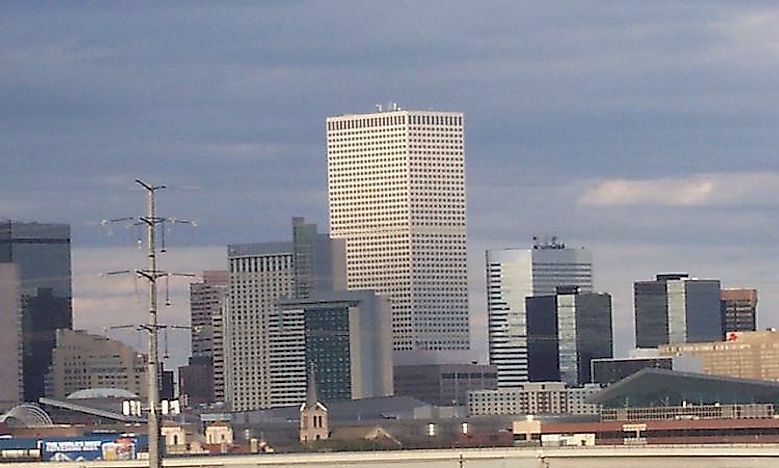 The skyline of Denver with the Republic Plaza as the tallest building. Denver is the largest city in the state of Colorado in the US. In 2015, Denver’s population was estimated at 682,245, and it is the 19th most populous city in the country. With its 2.8% population increase in 2015, it is also, considered among the fastest growing cities in the country. Like most big cities in the US, Denver is home to many high rises and skyscrapers. The tallest building in the State is Republic Plaza. The first tallest building was the Equitable Plaza, built in 1892, and rose to a height of 143 feet. At 714 feet, with 56 floors, Republic Plaza is the tallest building in Denver, and in the Rocky Mountain Region. It is the 109th-tallest building in the US and was completed in 1984. The design was done by Skidmore, Owings & Merrill, and construction was done by PCL Construction Services Inc. 1,200,000 square feet of the building is used for office space and three retail levels which comprise shops and service businesses. The building also features an art program, “Art in Public Places” that takes place quarterly, featuring artists from the region. At 709 feet, with 53 floors, 1801 Colorado Street was the tallest building in Denver before it was overtaken by Republic Plaza one year after it was completed. Now it ranks second among the tallest buildings in Denver. It was built in 1983. The building’s brown concrete facade is one of its unique characteristics, along with its shape which is like two interlocking octagonal sections; and its roof houses of antenna masts. The previous occupants of its offices were US West; these were followed by Qwest Communications; and later Century Link, who acquired Qwest Communications, and removed their sign from the top of the building, to replace it with their own, in 2011. The building was once famous for its high-rise signs, which were reputed to be the brightest in the world. Qwest Communications installed bright signs that were blue in color in 2000, but removed them in 2004 after receiving complaints from Denver residents and replaced them with darker ones. In 2011, the building was acquired by Brookfield Office Properties for $215 million from the Public Service Group. Transamerica, which today occupies a number of floors in the building, moved its Denver operations to 1801 California Street in 2011, and its logo was added to the building. Other business establishments include a coffee place and restaurants. At 698 feet, with 50 floors, the Wells Fargo Center is the third tallest building in Denver. The building resembles a cash register and is known locally as the "Cash Register Building." The building sits on a hill, making its overall elevation higher than the two tallest buildings. It was completed in 1983. Designing was done by the architect Philip Johnson, with the design being originally intended for a Texan downtown area – this explains why a heated roof is necessary for the accumulation of snow, which can slide perilously off the curved crown of the building. It has a sky bridge that ranges over the street connecting Wells Fargo Center to a building on 1700 Broadway. The second building contains a food court, and a museum comprising artifacts and Wells Fargo Memorabilia; it also houses the Wells Fargo Bank’s Downtown Denver Branch. At 641 feet, with 45 floors, the Four Seasons Hotel Denver ranks fourth among the tallest buildings in Denver. Completed in 2010, the building has 766,487 square feet of floor space, and its construction costs an estimated $350 million, making it the most expensive building owned by a private entity to be ever built in Denver. 24 of its lower floors house the Four Seasons Hotel and its upper 21 floors comprise of residential suites with 239 guest rooms and suites. It contains a fitness center, pool, and other amenities. At 548 feet, with 46 floors, 1999 Broadway is the fifth tallest building in Denver. Completed in 1985, the design work was done by Curtis W. Fentress of Fentress Architects. It has a unique structure: resembling a triangle with a scoop on the side; a design that was prompted by a desire for the Holy Ghost Catholic Church to be retained at the base of the building. As of yet, there is no prospective building that can take the title of tallest building in Denver from Republic Plaza. The tallest building under construction is 1144feet, which when completed in 2018 will stand at 603 feet, with 40 floors.